Mark Tully travels to Kolkata to listen in with a family - to find out more about the Goddess and meet two of the original musicians who played on that historic recording. Every year in autumn in Bengal in India thousands of families gather around their radios at 4am to hear how a Goddess slays a demon. They are listening to an oratorio, originally broadcast live from the 1930’s, and now a recording of a legendry performance made in 1966. Mark Tully travels to Kolkata to listen in with a family - to find out more about the Goddess and meet two of the original musicians who played on that historic recording. The Indian festival of Durga Puja celebrates the final vanquishing of the arrogant Buffalo Demon, Mahisasura, by the Goddess Durga. She is a fascinating and contradictory character. Her warlike form is that of Kali. Kali is often depicted coloured blue and always brandishes swords in her ten arms and sports a fetching garland of human skulls. But Durga is also considered the perfect daughter who visits her parents, is dutiful, and in statues has a peaceful almost Madonna-esque visage. 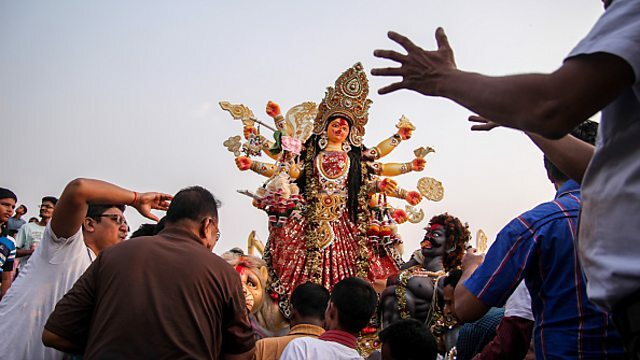 In Kolkata Mark Tully goes to the banks of the River Ganges where he meets artists who are working flat out on gigantic clay sculptures of Durga where this contradiction is clearly seen. When Mark meets the musicians they talk of the brilliant narration of the Sanskrit verses and how the studio was crowed with musicians, some in tears, moved by the religious experience. The Bollywood composer, Shantanu Moitra, reveals how the oratorio works from a technical point of view. In a school run by The Hope Foundation Mark hears how young girls are drawing lessons in empowerment and confidence from Durga.